Despite only arriving in Glasgow from Australia in early 2015, Encompass Corporation, a leading provider of KYC automation software used in financial and professional services organisations, has already attracted a reputation for being committed to the development of its young people. One such example is of Finlay Wilkinson, a member of the Encompass marketing team. In November 2015, after a period of unemployment, Finlay was recommended by his local Jobcentre to begin a seven week course through the BBC’s ‘Make it Digital’ programme because of his interest in digital marketing. This course taught Finlay digital skills like HTML coding, web design and video editing. Work-based skills like interview skills, CV building and team building were also taught. Following completion of the seven week course, and filled with confidence in his digital skills and ability to find a job, Finlay was invited to attend the BBC Make It Digital Launch day in November 2015. At the launch day, candidates who had completed the course were offered introductions to potential employers and it was here that Finlay met with Susie Kinsella, Marketing Manager at Encompass Corporation. As well as having a valuable skill set, as acquired through the BBC Make it Digital course, Susie was immediately taken with the enthusiasm that Finlay offered. As a result of this meeting, Susie offered Finlay a three week placement at Encompass, during which time he worked on such projects as social media, Salesforce and CRM-related work, and created a new banner video for the website home page. Impressed with the work that Finlay carried out during his three week tenure, Susie offered him a temporary contract. 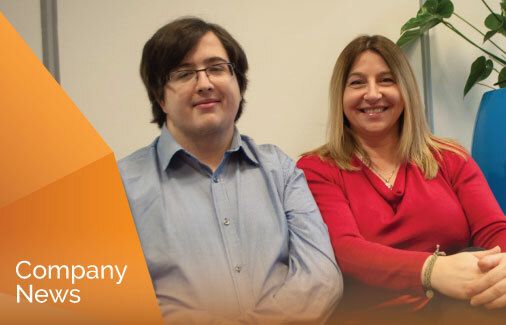 Together, Finlay and Susie investigated further training to bolster his skills, resulting in a digital skills apprenticeship offered by QA Apprenticeships Scotland and covering digital marketing and information technology and telecommunications. Throughout the course Finlay has received out of office training at the QA Apprenticeships offices in Glasgow, and shadowed members of the Encompass marketing team to complete self-teaching tasks. As a result of completing this course, and with help from Glasgow City Council who were able to offer funding, Finlay was rewarded with a full-time contract at Encompass. “The progress that Finlay has made in such a short period of time has been fantastic. From completing the BBC Make it Digital course, to the QA Apprenticeships digital skills apprenticeship, and the work he has done at Encompass, he has made himself an integral part of the Encompass marketing team. I’m sure Finlay will continue to progress his career within marketing in the years to come.